The Home button the is “regular” button (as opposed to the touch screen buttons) that is main primary button at the bottom of your iPad. 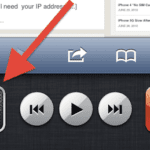 This is the button that you press to bring your iPad back to the Home screen. Pressing this button while it is already on the Home screen will take you to the Search screen instead. 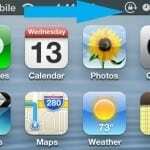 It is also the button that you press to take your iPad out of standby mode and to the “Slide to Unlock” screen. If you thought, “Hey, I didn’t know that you can customize the Home button”, then you would be correct. You can not customize the click behavior of the Home button. 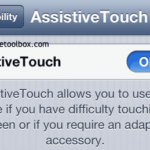 However, you can customize the “double-click” behavior of the Home button. Before you do, let’s learn what the typical double-click of the Home button does. The double-click of the Home button actually doesn’t do much. By default, if you double-click the Home button, it would just typically take you back to Home screen (just as it would if you had just clicked it). Unless however if you are in iPod mode, then it will take you to the iPod playback controls instead. If you like to customize the “double-click” of the Home button to something more useful, just follow these steps. 1. While on the Home screen, tap “Settings” to bring up the Settings screen. 2. On the Settings panel, tap “General”. 3. Then tap “Home” and you will see the settings that says “Double-click the home button for:” You will have three choices for this setting: “Home”, “Search”, “iPod”. By default, it is set to “Home”. However, you can set the double-click action to take you to Search screen or to iPod app simply by tapping on those options to checkmark it. For example, let’s tap “Search” to checkmark that option. Now the Search screen will comes up whenever the Home button is double-clicked. 4. Normally, if you double-click on the Home button while iPod is playing, it brings up the iPod controls. However, if you don’t want this, you can turn this behavior off. On the same Setting screen under iPod Controls, you will see the setting “when playing music, show iPod controls”. This setting can be “on” or “off”. Switch it to “off” andnow a double-click of the Home button would no longer bring up the “iPod Controls” even when the iPod is playing. Instead it will bring up whatever screen you had set in step 3.